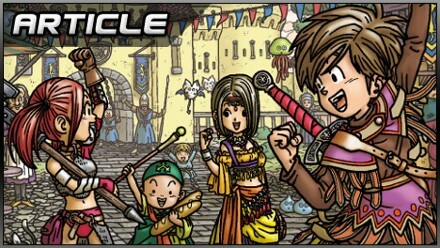 Opinion: what can Dragon Quest teach Final Fantasy? A Tale of Two JRPGs. Why Final Fantasy needs to learn to laugh at itself. They are to videogames what the Williams sisters are to professional tennis: gorgeous, intimidatingly successful and, in the absence of much real competition from beyond the gene pool, fierce rivals. I am, of course, referring to Final Fantasy and Dragon Quest. There’s more between these particular siblings than six Grand Slam titles, though. For all their common interest in filling what you thought were your sleeping hours with crunchy, charismatic role-playing goodness, in many respects the pair appear to spring from completely different bloodlines. Final Fantasy is baroque, ‘adult’, po-faced. Dragon Quest is cartoony, ‘childish’, unpretentious. A lot can be said for this lack of a family resemblance. In an industry notorious for rip-offs, it’s fantastic that two games can cosy up to approximately the same audience in such incredibly contrary fashions. But there’s no denying that the race has gotten a little one-sided of late, with the 13th Final Fantasy proving a love-or-hate experience for most, and as Dragon Quest IX: Sentinels of the Starry Sky rampages into European retailers amidst reviewer ecstasy, it’s perhaps worth asking what the new game can teach its slightly wayward sibling. For me, the key lesson consists of ‘crap’, and the ‘cutting’ thereof. Providing you accept the inherent ‘crappiness’ of the JRPG in general, its taste in weird statistical set-ups and dodgy narrative conceits, Dragon Quest has always, by and large, been a ‘crap-free’ experience. Its basic mechanics are basic indeed, well-worn and well-honed, occasionally to the point of tedium. Final Fantasy, by contrast, goes absolutely overboard on ‘crap’. It’s constantly reinventing itself, upending or inverting conventions, reassembling its earlier selves along bold, bling-heavy but sometimes unconvincing lines. What the series doesn’t remake, it renames or repaints. Final Fantasy XIII has turned in an especially operatic performance in this department. Plain old experience points have become fanciful (and disturbingly hormonal-sounding) ‘Crystogen Points’; the experience system itself is now ‘the Crystarium’, and resembles less a set of menu screens as another of the game’s massively over-designed environments, wreathed in purple fire. Wizards are not wizards, but ‘Ravagers’ , ‘Synergists’ and the like. It’s the videogame equivalent of a Lady Gaga music video, all dazzle and hyper-conceptual wrangling. 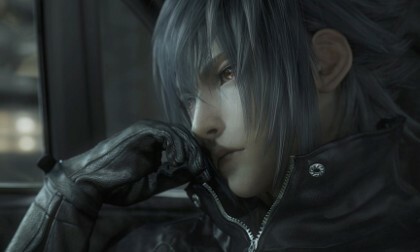 The forthcoming Final Fantasy Versus XIII. Looks like a right barrel of laughs, doesn't it. Final Fantasy’s devotion to excess is the symptom, in my opinion, of a tremendous need to be ‘taken seriously’, to be marvelled at, wept over, solemnly discussed. Angsty characterisations and achingly existential cut scenes are well-known series staples, but an adolescent pall also hangs around its battles and levelling pathways, its maps and inventories. This is a regrettable state of affairs because it makes it all the easier to mock Final Fantasy when it (inevitably?) overreaches itself and collapses into absurdity. Dragon Quest, meanwhile, almost never takes itself seriously. In fact, it encourages the player to do the opposite. Few other games are as fond of terrible puns, and no other game (with the possible exception of Monster Hunter) lets you garb your warriors in grinning blue Slime helmets. Sure, it has moments of grandiosity or sentimentality, but there’s a camp air to everything that has you chuckling even as the ‘thous’ and ‘thines’ build to a climax. The closest the main Final Fantasy series has ever come to this spirit of whimsy was Final Fantasy IX, often unfairly called a low point, which managed to fit in all Final Fantasy VIII’s enormities while still finding time for farcical bits like the Tantalus theatre heist and the Steiner/Beatrice romance scene, and refusing to do more than fine-tune the Materia and Active Time Battle systems of Final Fantasy VII. I think the 15th iteration (the 14th is an MMO) should pick up where it left off. Which franchise do you prefer, readers? Posted in Features, Spotlight, Top 5, and tagged with Japanese role-playing game, JRPG, Nintendo DS, PlayStation 3, wii, Xbox 360. Hmmm. So’s your face, possibly? I always did think Final Fantasy tried a little too much to revolutionize itself over and over, but ironically it seemed much more real to me than Dragon Quest. It was a game I felt I could easily step into to the shoes of the main characters and grasp their story. Dragon Quest has been outrageous, but in an extremely well written way. DQ feels classical and memorable, FF feels realistic and hip. In essence, they are two very different games with very powerful stories, but one, Dragon Quest, doesn’t have to try to be all “new generation”. It doesn’t have to be “modern”- in a away- to be great. I can go on and on, but I think I made my point. Love both, but DQ a bit more. Hello, i think that i noticed you visited my site so i came to ¡§return the want¡¨.I’m attempting to find things to improve my web site!I assume its adequate to make use of some of your ideas! !